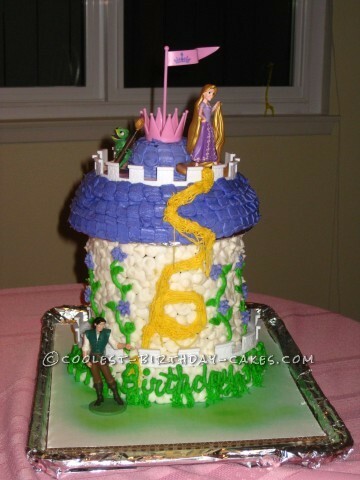 My friend’s 6-year-old loves all things Disney, so when the movie “Tangled” came out she wanted a very special cake. She supplied two crenelation circles made out of plastic, the Rapunzel and prince figures, plus the crown/flag for the top of the tower. I made 2 8-inch rounds, 4 6-inch rounds, and the extra batter went into cupcakes (one for the very top of the tower). I layered them as follows, from bottom to top: 8-inch round, large plastic crenelation 3 6-inch rounds, cardboard support (with a hole in the middle), 8-inch round, 6-inch round, small plastic crenelation and cupcake. Then I poked a wooden skewer through the center to help keep everything in place. Frosting was easy: I used the largest round tip I could find and just globed it all over the walls to look like stones. Similarly for the “shingles” on the roof, I used a wide, flat tip. Then I placed Rapunzel at the top, using a grass tip to extend her hair all the way down the side. A few ivy and flower vines growing up the side, grass, and the Prince at the bottom added the finishing touches. My girlfriend, her family, and all the friends at the birthday party were amazed at how this cake looked! Birthday cake idea Posted by Melanie P.